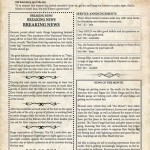 We have a new issue of The Scrapbridge Gazette on the Downloads section of our website. With triple pages in this special number 50 full of news!! !